This is one of a series of Player Q&A's for the Sioux Falls Storm. This Q&A was submitted to all 10 IFL teams. We will post those which we have received periodically throughout the season. Thank you to Storm Director of Media Relations for assisting in bringing this feature to our readers. Photo courtesy Sioux Falls Storm. Graphic by David/SCtoC. 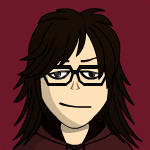 Data input by Monika/SCtoC. 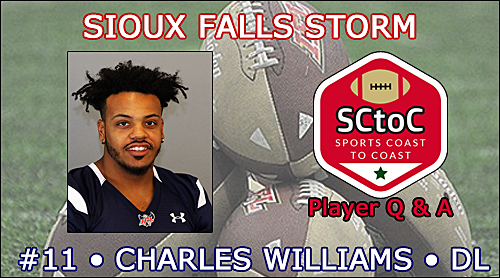 Charles Williams is in his first full season with the Storm after having signed during the 2018 season. He is 6'2" and 250 lbs, from Plantation, Florida. In four seasons at Northwood University (Midland, Michigan), he recorded 156 total tackles, 17.5 sacks, 38 tackles for loss and five pass break-ups in 33 games. To be able to play past the collegiate level. Things are happening a lot faster. To earn enough to support myself, my family and my future business. Getting picked up from a higher level. To showcase my ability and win a championship. My passion for the game of football.